Sometimes you know you’re onto a quality lid the moment you unbox it. 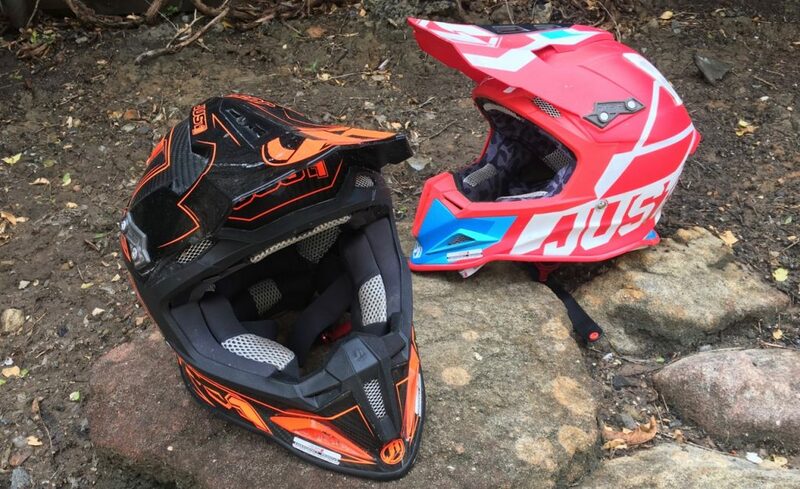 That’s what I thought when I first laid eyes on the latest Just 1 off-road helmet called the J12. As pictured, both colourways wreak of quality headwear, kind of like when you stroll through a BMW car dealership and the fast one is dressed up in all the latest flashy gear. The matt finish red option looks just as good as the carbon wrap. Pick them up and they feel light, tipping the scales at 1.1kg. It’s not the lightest helmet on the market but certainly lighter than most. Slip it on your noggin and it’s comfortable. I’m a size large and the J12 is a tight fit, but it feels like it wraps my skull perfectly. It’s the perfect fit, without making me feel like I’m chewing on my cheeks. It runs the standard D-ring strap system with a press stud for the left over bit. I’d prefer a magnetic option so it’s less fiddly, same goes for the helmet liner which is also a clip in system, making removal of the liner for washing a slightly more time consuming ordeal than the magnetic pads seen on some other helmets. Safety is also at a premium on this premium lid. The chinbar is neckbrace compatible, the cheek pads feature Just 1’s emergency removal technology, and the shell is ECE homologated.